WAXIE Microfiber cloth is constructed from 70 percent polyester and 30 percent polyamide synthetic fibers, each cloth will lift and trap lint, dust particles, dirt, grease, grime, waxes and oily residue. 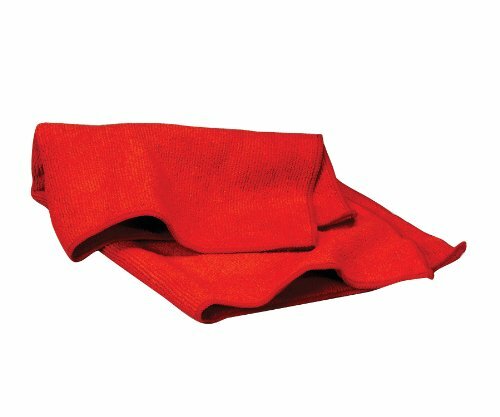 Microfiber cloths can be washed and reused hundreds of times and they hold up to 7 times their own weight in liquid. Do not use bleach or fabric softeners when laundering as they can diminish the effectiveness of the microfiber. Air dry or use low machine settings to protect polyester and polyamide fibers. Measures 16-inches length by 16-inches width. Microfiber cleaning cloths prevens cross-contamination or color-code by department with 6 colors available for use with a variety of tasks. Microfiber performs best when dampened with water or cleaning solution and they can be used dry. Available in red color. Case of 180 microfiber cloths. WAXIE Sanitary Supply manufactures sanitary and janitorial supplies, tools, and equipment. The company, founded in 1945, is headquartered in San Diego, CA.